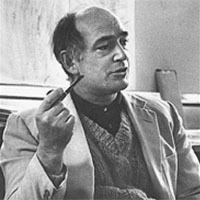 Born in Italy, Bertoia moved to the USA in 1930 and studied art and design at a number of institutions. At the Cranbrook Academy of Art he encountered Walter Gropius and Ray and Charles Eames. Subsequently he made jewellery and during the war worked for Charles and Ray Eames. In 1950 he then worked for Hans and Florence Knoll and it was here that he designed his five “wire pieces” of furniture, most notably the Wire High Stool. So successful were these designs that Bertoia was able to “retire” and devote his time to sound sculpture.